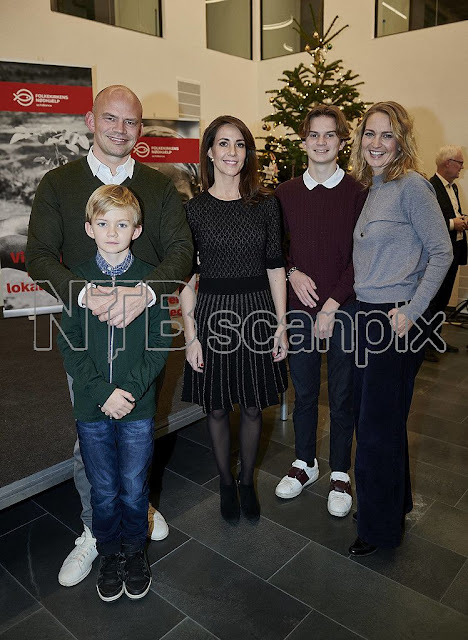 Marie participates in the Danish People's Church Aid (Folkekirkens Nødhjælps) Christmas event. 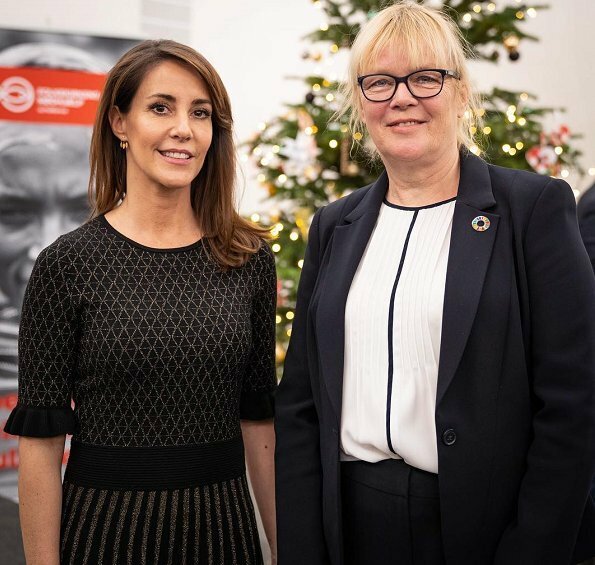 The Christmas event is held for the Danish People's Aid Partners, to thank them for the support for the organization's work. Marie has been the patron of the Danish People's Aid since 2011. 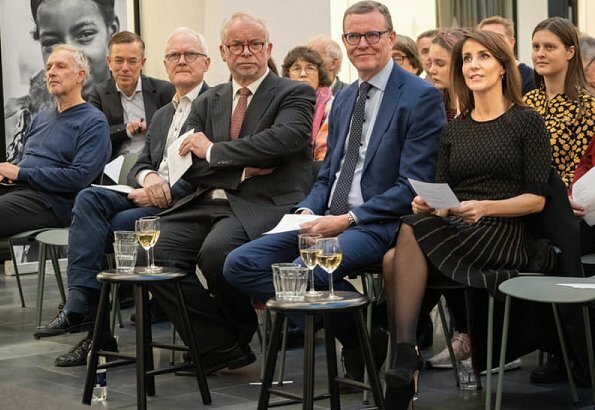 DCA - In DCA emergency aid we say these days thanks to all those who support the work of the world's poorest - our patron Princess Marie, our council and board of directors, donors and volunteer. I'm so glad she's the patron for this group. She is absolutely the best choice of person for this event. You don't have to worry about her showing up to this event wearing disgusting amounts of jewelry/overly expensive clothing. I love she recycled this dress, it was about this time last year that she wore it last, yes? Perfect for the holidays. And I loooove those earrings, I'll wager they're not $2k either. Any idea of price? The contrast between her and Mosh couldn't be greater imo. Glad at least one of them is comfortable in their own skin and enjoying their life. I love this Elise Gug dress. It's by a Danish designer, and she's recycling it. It's perfect! Not a fan of the earrings, but as long as they didn't cost enough to feed an entire village of people, I don't mind them. I can’t believe the age gap between Mary and Marie isn’t 15 years. Renovation Building Voergaard Slot was built in 1580. The castle is today a self-governing institution and furnished as a museum. "Start the Christmas holiday with Christmas at the castle. Enjoy juicy cakes and delicious delicacies, find exciting Christmas presents and beautiful, unique Christmas decorations, Christmas trees, decorations and everything else that makes it smell, taste and feel like Christmas. We decorate the castle and invite you to the smell of home baking and Christmas decorations. Of course Santa Claus also visits Voergaard and has a Christmas party and candy." Voergaard has a royal visit from Princess Marie on Thursday. On arrival, the princess was welcomed by the Chairman of the Board of Voergaard Slot and French Consul, Anker Laden-Larsen, and the Mayor of Brønderslev, Mikael Klitgaard, who spoke in honor of the princess. - "We are very proud that Princess Marie visits the castle. It fits well with our Christmas exhibition and the many French cultural treasures the castle houses", says Anker Laden-Andersen. - "We are honored by the visit. It is important for Voergaard Slot, and it's not long after the castle has been voted Denmark's most beautiful manor house", he adds. A final program will only be published next week, but a quick look at the castle's website reveals that the princess's visit does not coincide with one of the days when the castle's Christmas exhibition is open to the public. - "It will not be a public visit that way, but we have invited a large number of people to reception to meet the princess. But do not think people can be allowed to see when the princess arrives", says Anker Laden-Andersen. 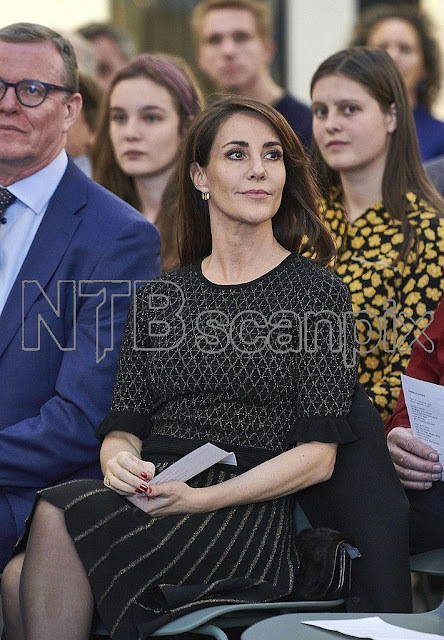 After talking and reception, Princess Marie was shown around and informed about the thoughts behind Voergaard's Christmas decoration. It is fifteen consecutive years that the castle, which was recently voted Denmark's most beautiful manor house, openened its doors to a Christmas-decorated setting. Once again, the royal court supplier and florist, Bjarne Als, has decorated Voergaard up to Christmas. The theme this year is "Greve Oberbech-Clausen's adventurous journey from Bordeaux and Paris to Voergaard Castle". That's why the castle is decorated with the French Christmas traditions combined with the many artifacts brought by Oberbech-Clausen from its time in Frankring. Anker Laden-Andersen for that reason was exited that it was French-born Princess Marie who is visiting the castle. 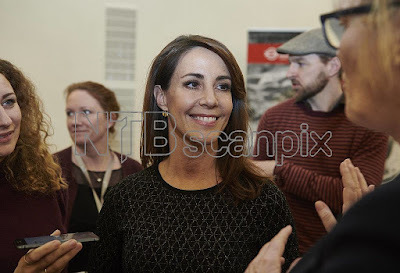 - "It is a great honor that HKH Princess Marie visits Voergaard Slot. We are looking forward to telling her about Voergaard Slot's French history and showing the princess how Voergaard's living rooms have been transformed into a beautiful Christmas universe", said Anker Laden-Andersen prior to the classy visit. It was the first time that Princess Marie visited Voergaard Slot, known for its great French collections of, among other things, art. - "I am very proud to visit the beautiful manor house", said it from the princess. - "It's very different, creative and very cozy", Princess Marie said about the Christmas exhibition. - "I am very impressed. I think it's a fantastic collection of French art and architecture. It's very very nice", Princess Marie said after an hour and a half at the Voergaard castle. What I find attractive is that she really seems to be interested and engaged at everything around her during this visit. Including the people. She seems to be more close and warm, assets I often miss in pictures (and clips) of Mary's visits. Marie is a very tactile person, warm and engaged. Her energy radiates out to others, that's why the impressions of her surroundings are in stark contrast to the ones that we see of Yrma. Imagine the high-fives when an organisation gets word that it's Marie who is coming to their event! the last few engagements I noticed that Marie's LIW was not present. Is she on vacation, someone in her family ill?